Having taken inspiration from Charlie’s beloved polo hat, we first created a logo for Charlie to start using on his website, as well as for social media and stationery. 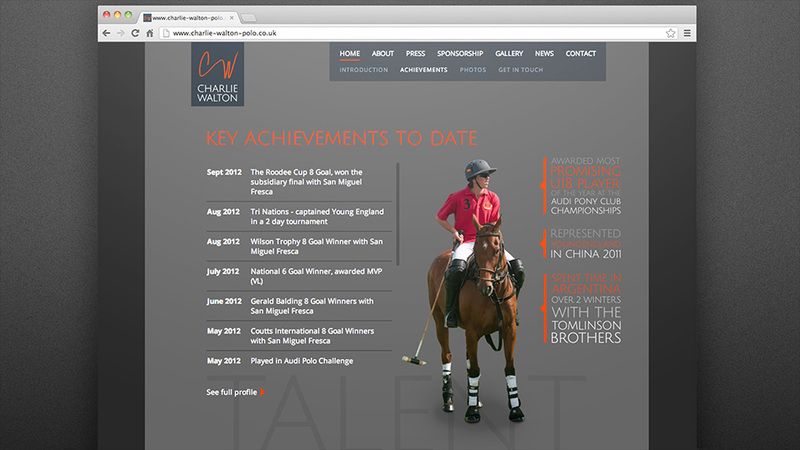 We developed a really modern, unique brand image, befitting a young professional polo player looking to progress his career. 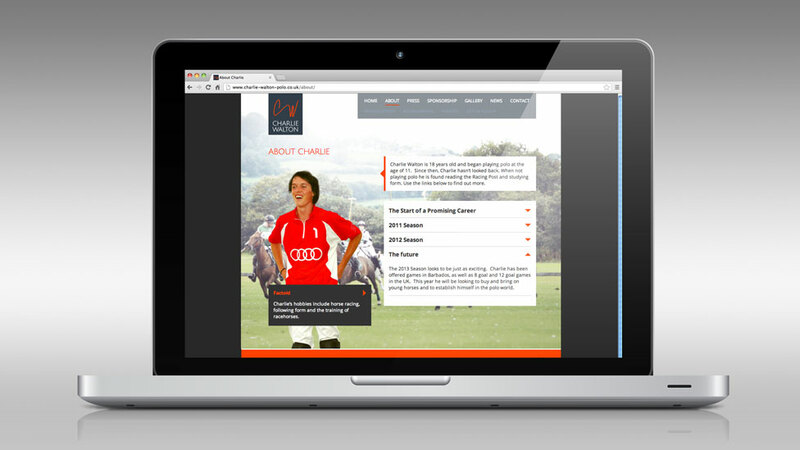 The look we knew was right for Charlie’s polo website was one which would be bright, colourful, inspirational and informative, and we used these principles as building blocks for the design. To make a real impact, we added typography, colour and movement to the design. This was enhanced with the integration of action photography and the typographic words Passion, Talent, Drive, Ambition, all used with the popular ‘parallax scrolling’ effect. Various design element also animate onto the screen at specific ‘waypoints’ as the user scrolls, using custom animations that work in all browsers, smartphones and tablets. The outcome was a parallax website design that was modern, fresh and eye-catching for Charlie’s target audiences of sporting journals, newspapers, other players, friends and supporters. WordPress was the content management system (CMS) of choice to enable Charlie to easily manage the website and update the content, including the image slideshow, career highlights to date, latest news, little facts about Charlie and adding new publications and articles. All this information is aimed at helping readers and potential sponsors to get a good overview of his prowess and future potential. 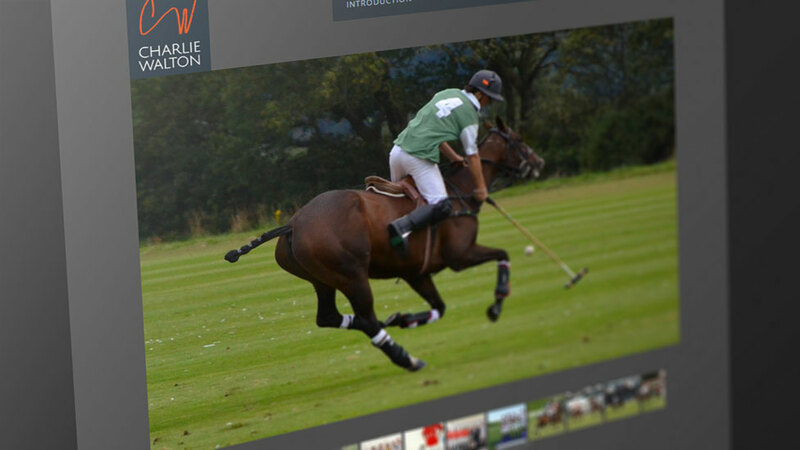 We also included a Twitter feed so that Charlie could tweet before, during and after matches to maintain the excitement which goes hand in hand with any polo event, together with a news and blog section with search and archive features. 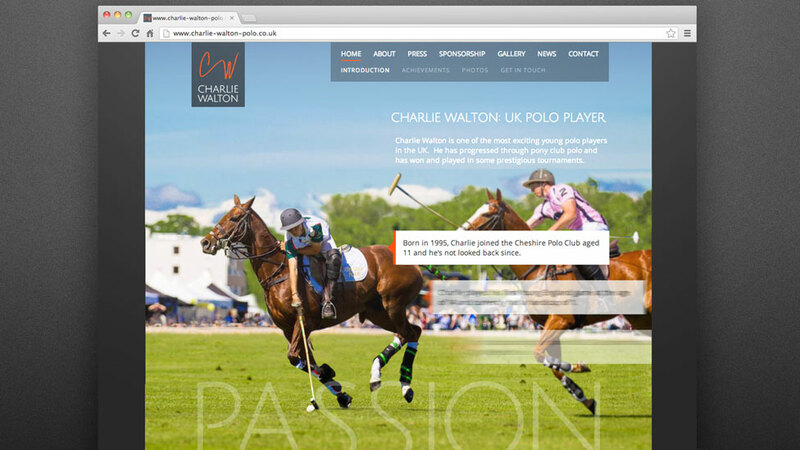 The completed design project echoes the foundations upon which the new Charlie Walton brand is now going from strength to strength. We were proud to be chosen by Elite P3 to design its identity and develop its new website. Our team responded with a high-performance brand design which connected with audiences visually, both online and in print. The project required a distinctive logo that communicated the passion at the heart of the project to the fans that would be using the service online.